Fall scene by the lake. 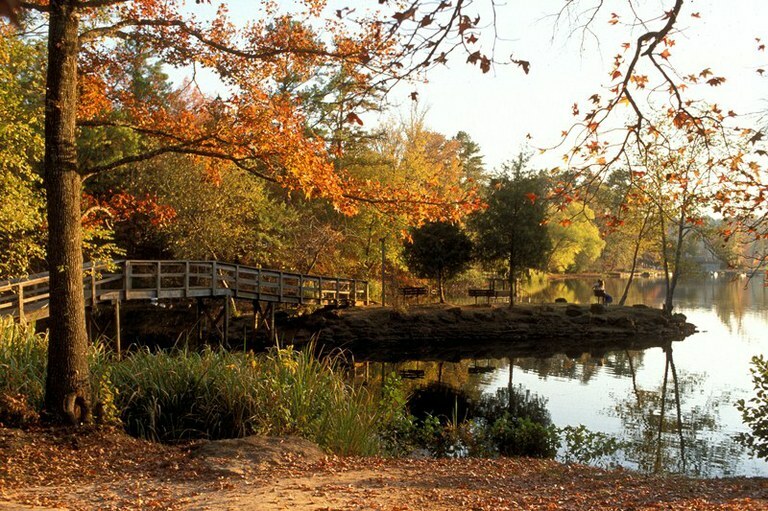 Tyler State Park is located near the western edge of the Pineywoods ecoregion, near its border with the Post Oak Savannah ecoregion. As a result, plants from both ecoregions grow in the park. This area is in the Sabine River Basin. CCC workers created the lake by damming an unnamed creek that begins at Beauchamp Springs (you can see this on the Whispering Pines Nature Trail). Water from the lake’s spillway eventually flows into Saline Creek, a major tributary of the Sabine. With a humid, subtropical climate, the park gets an average of 44 inches of rain annually. Winters are mild and short, with an average temperature of 46 degrees. The summer average is 80 degrees. The Civilian Conservation Corps arrived here in 1935, and found a place without trees. Between logging and clearing for farming, few native plants remained. The first job of the CCC was to restore the land to its natural state. To that end, workers built dams and terraces to control erosion. Then they planted over 600 acres with native trees and shrubs raised in a nursery on site. Shortleaf pine is the dominant pine in higher, drier areas of the park, while loblolly pine grows in the lower elevations. Hardwoods found in the park include oaks (southern red, post, blackjack, black, bluejack and water), sweetgum, eastern red cedar, pecan, sassafras, black walnut, sugarberry and slippery elm. Understory trees like flowering dogwood, eastern redbud and Mexican plum bloom in the spring. Oaks, sweetgums and maples offer fall color. The purple berries of American beautyberry and red berries of yaupon holly provide festive color in the winter. Many flowering plants and grasses grow in the park. Wildflowers include brown-eyed Susans, spiderwort, butterflyweed, beebalm, standing cypress, coreopsis, verbena, yucca, fleabane, goldenrod and purple coneflower. Native grasses found in the more open areas in the park include little bluestem, purple top, lovegrass, broomsedge, Indiangrass and plume grass. Early explorers reported that this area was an open forest with tall grasses and wildflowers. Every few years a wildfire burned through, reducing the number of woody understory plants. However, settlers put out those wildfires to protect their homesteads. Over time, woody plants spread, shading the ground and changing the nature of these East Texas woods. 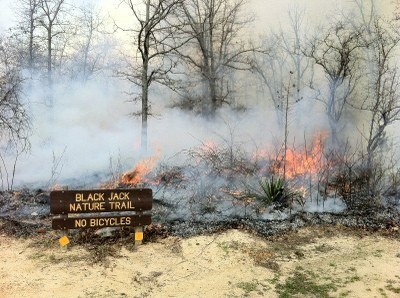 Now Tyler State Park uses controlled burns and selective thinning to manage the forest. These practices help maintain an open forest canopy, which in turn allows sunlight to reach the ground so a wider variety of wildflowers and grasses can thrive. The park is one of the few places where you can see what the Pineywoods looked like before logging, fire suppression and farming changed the land. Keep Texas Wild: Pineywoods (a TPWD video). Because of the ongoing habitat restoration work at the park, a greater variety of plants has led to a greater variety of wildlife. Tyler State Park is home to a number of East Texas animals, including white-tailed deer, raccoon, squirrel, fox, coyote and opossum. You might cross paths with an armadillo or a skunk. Reptiles such as snakes, lizards, salamanders, frogs and toads live here, too. Over 200 species of birds have been identified in the park. Some of our regulars (such as the pine warbler and the brown-headed nuthatch) can be seen year-round. Butterflies and Moths of Smith County. Tyler State Park has forest communities made up of plants and animals that depend on each other for survival. Some members produce food, some provide shelter, and still others clean up. They also need water, found in the springs, drainages and lake in the park. Keep your food out of reach and avoid feeding animals. Don't pocket the past! Enjoy but do not disturb historical places.